There has not been an account of the first attempt made in Scotland to restore the exiled Stuarts at the end of the seventeenth century for three decades; most accounts stop with the death of the movement’s first leader, ‘Bonnie Dundee’. This book is the first full length account of the military struggle between forces loyal to the newly established Scottish government and the Jacobite cause. It does this by first considering the political and religious situation in Scotland, and to a lesser extent its southern neighbour, from the Restoration of the monarchy in 1660 to the revolution of 1688-1689, which was far more radical in Scotland than it was in England, and which produced a constituency with a grievance which a new restoration might solve. The book then turns to the initial campaigning by both armies, led by Dundee and for the government, General Hugh Mackay, a fellow Scot. With marches and counter marches being inconclusive, the possession of Blair Castle focussed attentions and led to confrontation. But before examining the ensuing battle, the book turns to the officers and men of each army, exploring who they were, their tactics, arms, equipment and organisation. 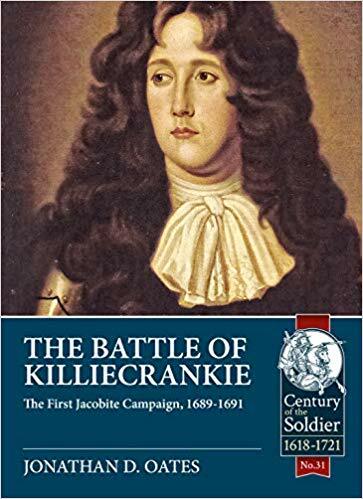 The most substantial chapter is a blow by blow account of the battle of Killiecrankie, beginning with the march to conflict on the day itself, discussions over whether to fight, deployment and initial exchanges of fire. Then the crux of the battle is described, the rush of the Highlanders, the musketry of their opponents, melee and the flight and pursuit. Some of Mackay’s army stood and repelled their enemy, but by the day’s end were obliged to retreat. There is an examination of the numbers of men who fought and the casualties and other losses taken by both sides; including that of the Jacobite commander. A discussion of the battle’s aftermath and its importance then occurs. The conflict was far from over, for the Jacobite army reached its numerical high point after Dundee’s death. There was another battle to be fought that season, at Dunkeld, which was unusual for it was fought in a town. As with the previous battle, this chapter looks at the combatants involved as well as the fighting and its aftermath. The chapter also reviews the campaigning before and after the battle to take the reader until the end of the year. The penultimate chapter covers the final major military engagement of the conflict, at Cromdale, as well as numerous other lesser encounters, skirmishes and sieges, and other developments in the government’s strategy to bring peace to the Highlands. Finally, there is a chapter covering the campaign’s end; which ended with a peace treaty and then the tragedy of Glencoe, and a commentary about the ending of hostilities and the careers of a number of prominent men who fought in the campaign. The book is largely based on primary sources, both published and manuscript from record offices and libraries in London and Edinburgh. These include letters, memoirs, poems, army listings and contemporary newspapers. Recourse has also been made to studies of the battlefield archaeology and the author having walked the battlefields, one with a local expert. There is also a brief description of the battlefields as they are today.